Download this easy-to-understand infographic overview of machine learning basics to learn about popular algorithms used to answer common machine learning questions. Algorithm examples help the machine learning beginner understand which algorithms to use and what they're used for. 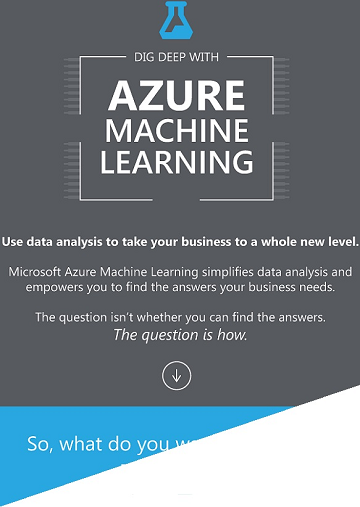 Azure Machine Learning Studio comes with a large library of algorithms for predictive analytics. This infographic identifies four popular families of algorithms - regression, anomaly detection, clustering, and classification - and provides links to working examples in the Azure AI Gallery. The Gallery contains example experiments and tutorials that demonstrate how these algorithms can be applied in many real-world solutions. For a deeper discussion of the different types of machine learning algorithms, how they're used, and how to choose the right one for your solution, see How to choose algorithms for Microsoft Azure Machine Learning Studio. For a list by category of all the machine learning algorithms available in Machine Learning Studio, see Initialize Model in the Machine Learning Studio Algorithm and Module Help. For a complete alphabetical list of algorithms and modules in Machine Learning Studio, see A-Z list of Machine Learning Studio modules in Machine Learning Studio Algorithm and Module Help. For an overview of the Azure AI Gallery and the many community-generated resources available there, see Share and discover resources in the Azure AI Gallery.